FAQ: Do you have a cut-sheet or specifications for the pillow tanks? Do you have a cut sheet for pillow tank? I have purchased a few of the 6000 gallon pillow tanks in the past and want to know if you can send me a cut sheet of this product to put into a report. We can deliver cut sheets for technical specifications of our pillow tanks. Once we have established which of these liquids you will need to be storing in your tank, we can send you a cut sheet for the typically fabric material used for the tank including various fitting options. Fabrics: The standard fabrics used to construct these tanks include polyurethane, polymer alloy and E PVC coated materials. Stronger fabrics may be used if tough liquids, such as diesel or Jet A fuel are being stored inside the unit. Fittings: Standard fittings will be constructed on the tank in either 3/4" to 2" in size. Larger fittings, such as 4" to 6" may also be available upon request. Optional Fittings: Optional fittings may also be added as needed to your tank. These fittings include a pressure relief cap, fill/drain port, dust cap and more. 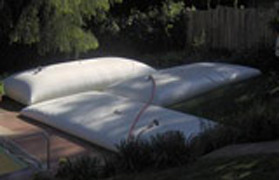 For more specifications regarding your specific storage requirements, check out our Pillow Tank Page.